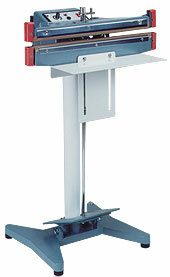 The Seal and Cut Impulse Sealer (FDC models) is the first model made to cut and seal in one operation. With the help of both a round wire and a flat 2 mm wire. It gives the operator the secured seal while eliminating the excess material a quarter of an inch away. This Seal and Cut Impulse Sealer can extend its abilities with and additional accessory that allows the sealing head to be adjustable in different sealing angles. Please refer to the accessory section for the tilt accessory. Max. Seal Length 12 " 18 " 24 "